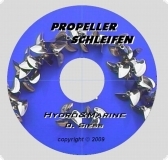 Rennpropeller von Hydro&Marine mit M4 Gewinde für Hydroantriebe. Propeller size, the so-called "SET and ACTUAL made ​​size"
Our propellers are measured and unified after Rohlingmaß. These are after casting often different in outer diameter, ie depending on the production can diameter differences +/- 2-3% occur. (Eg, a 40 mm (the so-called IS-made size "40") can after production between 38.8 - 41.2 mm be. Depending on the degree of processing, with ground and machined propellers of the outside diameter is reduced depending on the size. These problems they certainly know when they have worked their propellers. 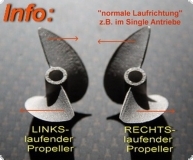 We therefore advise you to add, as required, the propeller size a + in size to as you can to a large propeller in reducing reversed rather difficult.